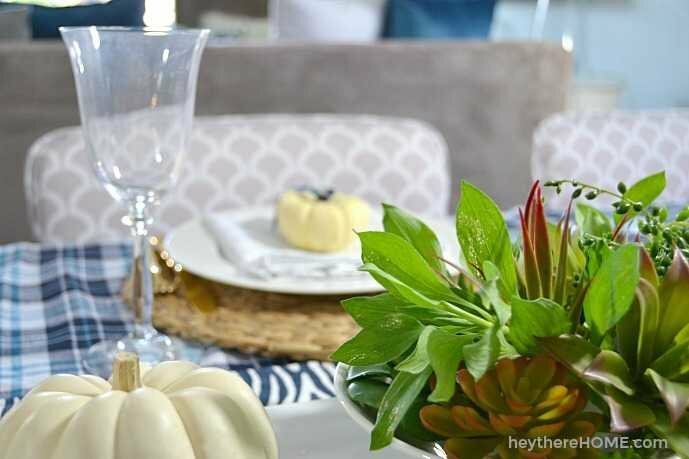 3 simple steps to an easy and casual fall tablescape. 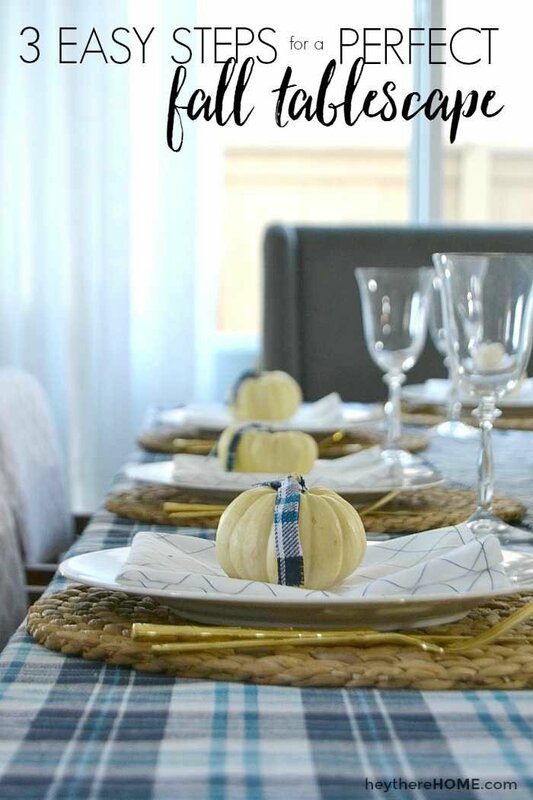 3 simple steps to an easy and casual fall tablescape. 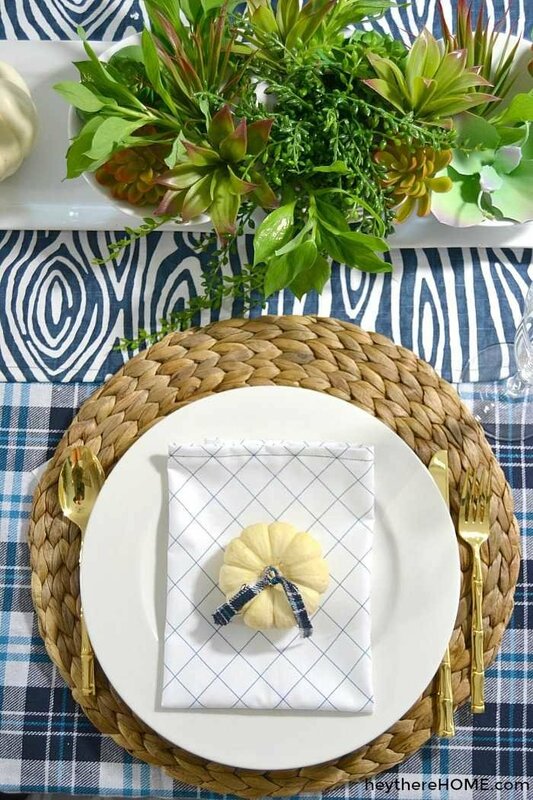 Inside: Mixing fabrics doesn’t have to be difficult and playing with plaid on your fall tablescape is an easy way to make it beautiful. I finally had to whip out a sweatshirt this week so I guess that means Southern California fall is in full effect and I love it! My absolute favorite thing (about any season really) is getting together with friends and family, sharing a meal, some wine, laughing, and catching up. I rarely do fancy but I do like to make a few of those holiday get togethers a little extra special. 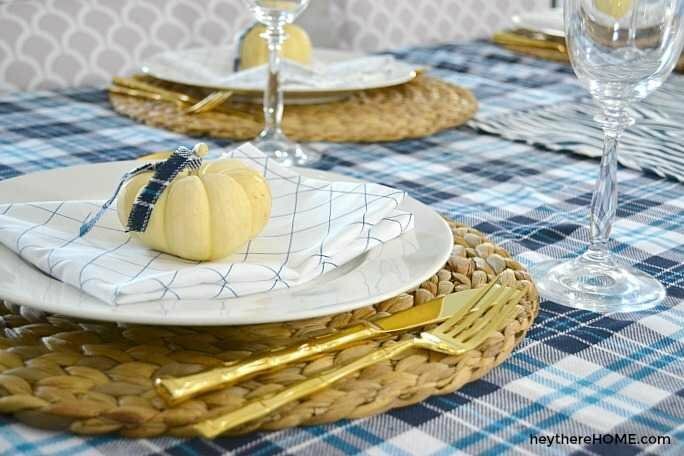 Nothing says casual and cozy like plaid and since you can find plaid in really any color scheme you are going for, I decided to stick with my blues and play with plaids on my fall tablescape this year. The coolest part about plaid is there aren’t really any rules. You can’t mess it up. But I know you’re here for a few tips, so don’t worry. 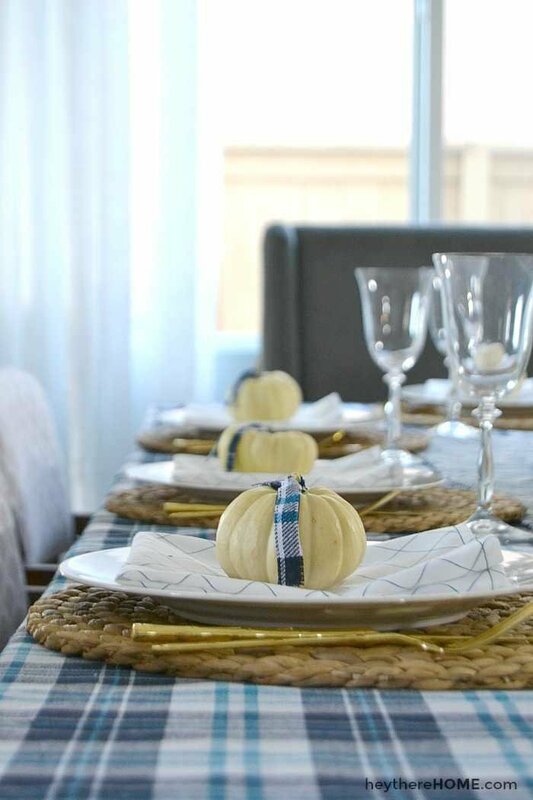 I’ll give you some that will make mixing plaids and creating a fall table super easy. The first thing I did was decide on the color palette I wanted to use. In the past, I’ve let the season sorta dictate which colors I use, but honestly, I’m not a huge fan of orange. So this year I decided to keep with the colors of my home and keep it really simple. 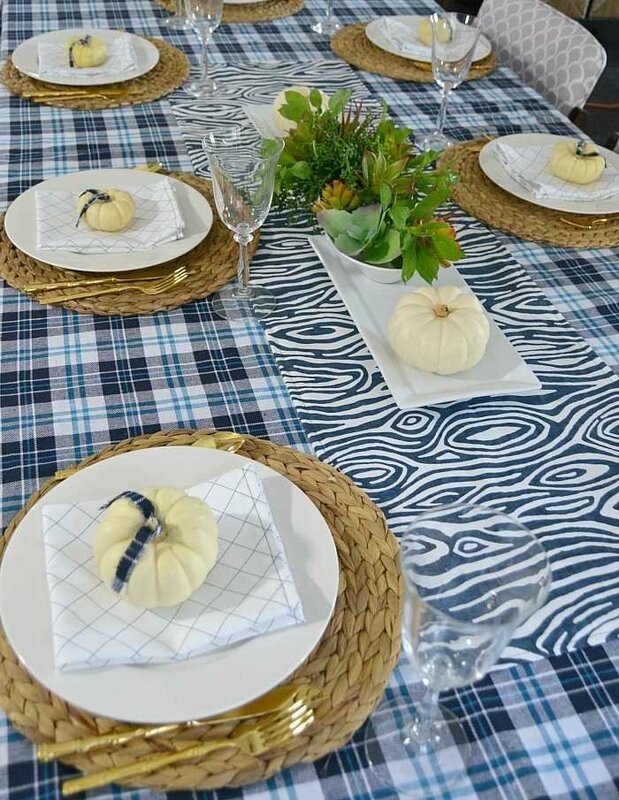 I knew I wanted the plaid to play a big role, so I picked a blue and white plaid fabric to use as the tablecloth. 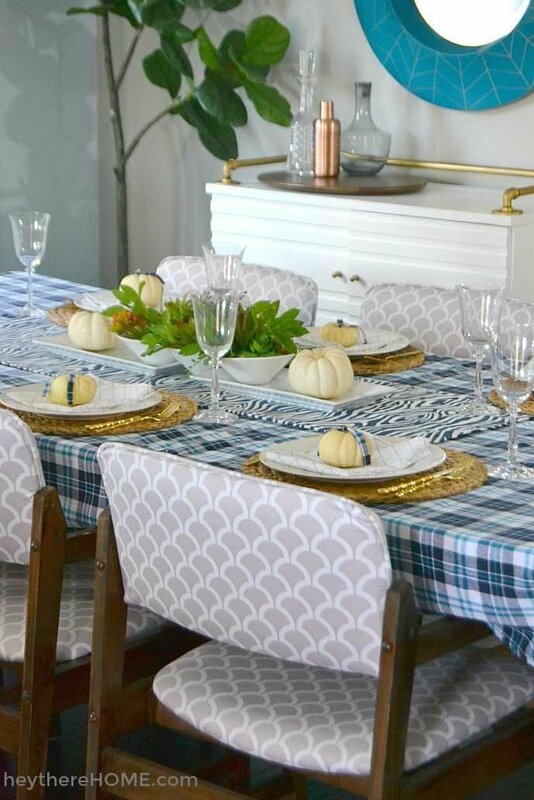 Think of the tablecloth you use as the anchor for the rest of the table decor. There are a few different colors going on in this plaid. I pulled from those colors when choosing the rest of my fabrics. This tablecloth didn’t require any sewing. Before I ordered the fabric, I measured my table and when it came, all I had to do was trim one edge a little bit and put it on the table! Don’t you love that? 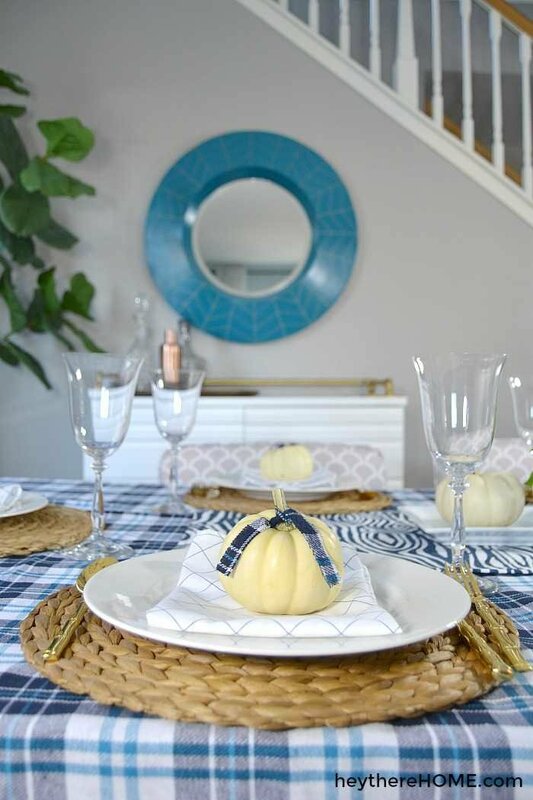 The next step for any easy tablescape is to draw the attention to the center of the table. I like to layer another material on top of my tablecloth to anchor the centerpiece. 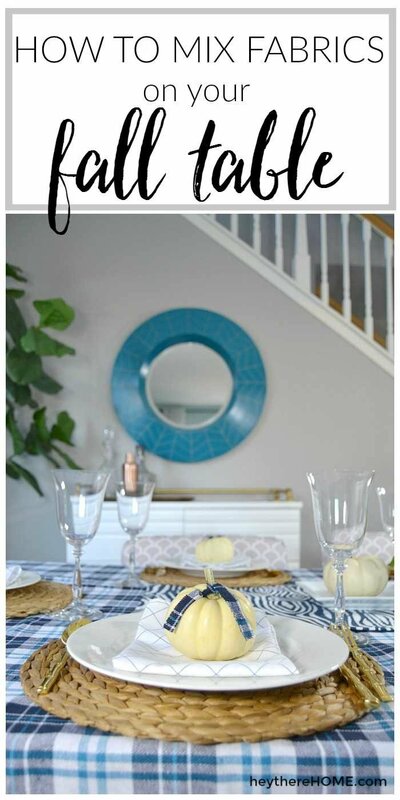 In this case I sewed up a quick table runner, but you could also use wood, or layer placemats or even napkins down the center to add this layer. 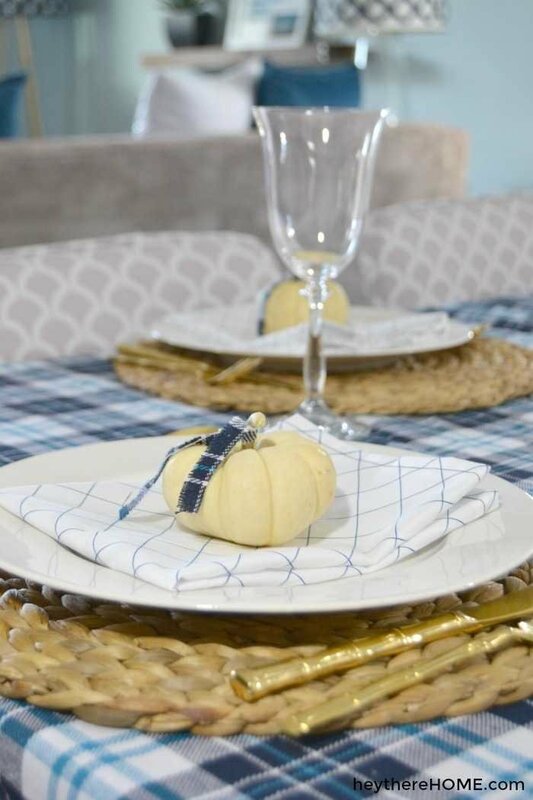 I pulled the deep blue from the tablecloth plaid fabric and found this fun modern blue and white fabric that nods to woodgrain. Perfect for fall without going into rustic. Nothing against rustic, just wasn’t what I was going for here. 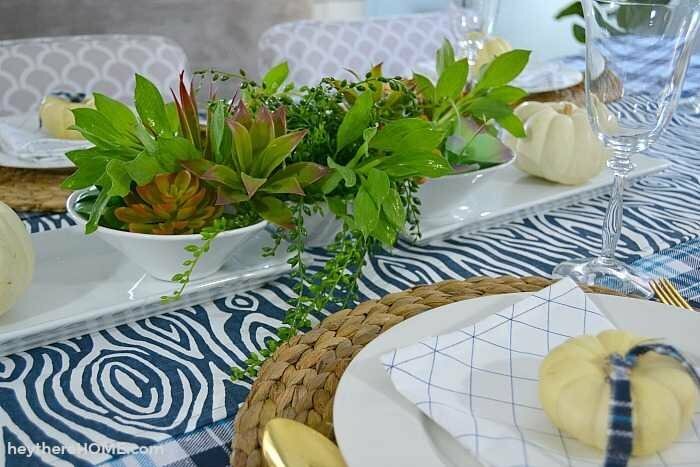 On top of the table runner, I used a white dish (usually used for fixin’s when it’s taco night) as a planter and stuffed some fake succulents in it, then filled in the blank spots with some plant clippings from my yard. When I first placed it on top of the table runner it looked weird because it was too short. It looked disproportionate to the length of the table and the table runner. My fix was to grab 2 long plates from my kitchen and hook them under each end of the planter to make the whole thing a bit longer and more in proportion. 2 white pumpkins on the end were the perfect (and simple) fall touch. I enlisted the help of my little mister to set the table. The place settings follow the same pattern. 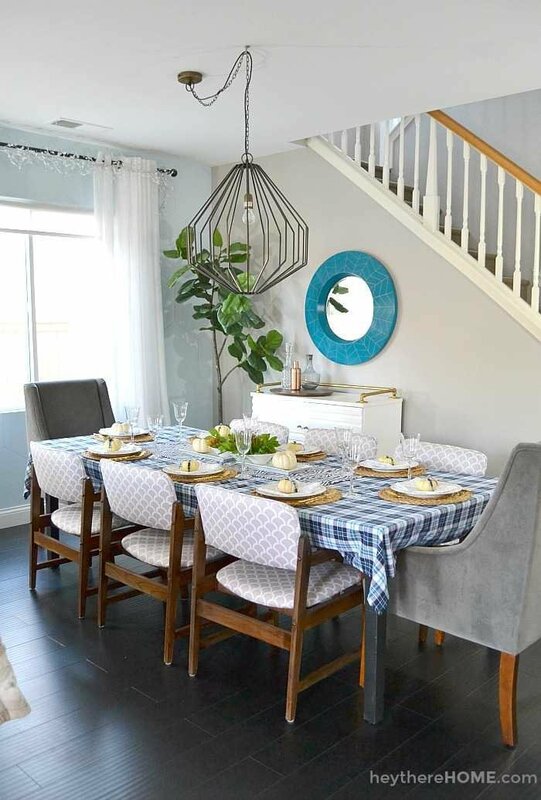 To add texture and to anchor the plates, we added a woven place mat to each place setting and placed my everyday white dishes on top. The next fabric I chose was a really simple blue and white grid fabric that I sewed into napkins. 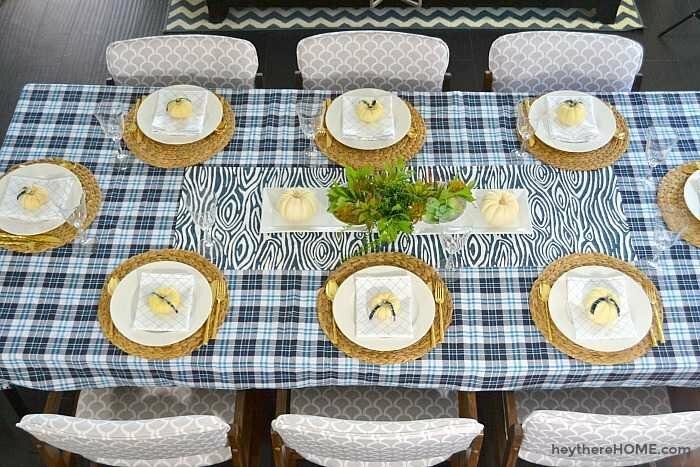 Again, the blue is pulled from the main tablecloth fabric, and instead of it being organic like the table runner, I went with a true geometric to mimic the squares in the original plaid, but in a much simpler way. 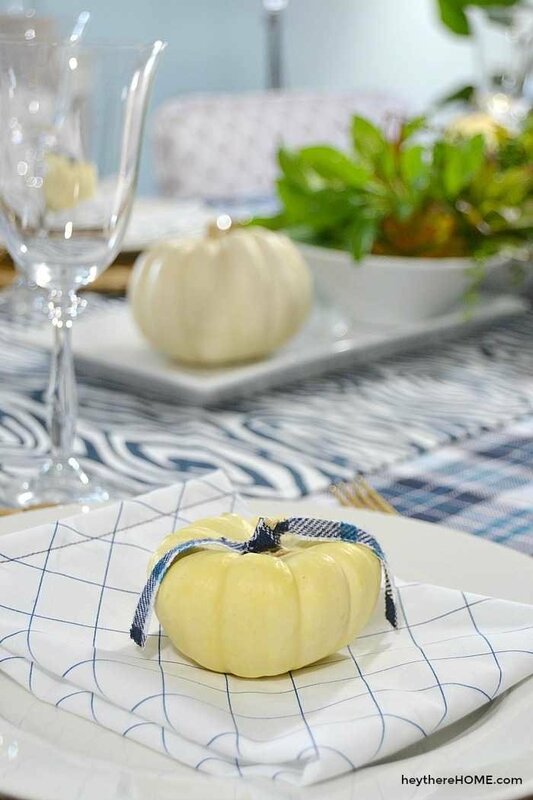 I folded the napkins in an almost square to keep it simple but also to repeat the squares in the fabrics and placed a mini white pumpkin on each napkin, but there was still something missing. 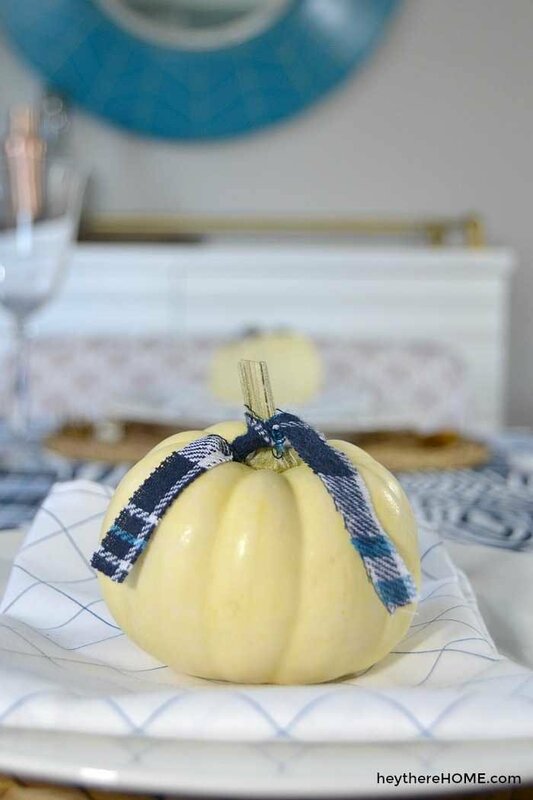 I had cut just a little bit off one edge of my tablecloth to make the edge straight and decided it would be the perfect finishing touch to tie it all together, so I cut little strips of the plaid flannel fabric and tied it around each pumpkin stem. I love how simple, yet beautiful this table is. It isn’t so fancy that you can’t tell an inappropriate joke during after dinner conversation, but it is just thought out enough to make it special. I’m loving how these 3 fabrics work together, but aren’t too matchy-matchy. Blue and white grid (napkins) -this fabric is no longer available, but I think this one and this one would be perfect too! Don’t forget to pin your favorite image before you go! A big THANK YOU to fabric.com for sponsoring this post. Fabric.com has been my go to source for fabric for a long time and I’m honored to work with them to bring you fabric loving inspiration! Thank you so much for this valuable information. I want to start my own painting business badly. I just started reading your articles on your website. Great and informative post. You’re so welcome David, thanks for stopping by! I was wondering about the tree in the background. have been looking for one that is artificial…any advice! PS I love the little strip of flannel on the pumpkins. So clever. I love your tablescape. It is so together. I just hope my dining room is complete by Thanksgiving. I have never done a centerpiece because there was just not enough room with serving dishes on the table. I will now have a buffet tor serving dishes. I may just get it together this year.